My story starts like a lot of little puppies. I was born into a poor family from Riverside County, CA on July 7th, and I was immediately put up for adoption. No papers, no dowry, all I had was the hope that my new home would be a loving, happy home. I was confident that I was gonna be able to do my part and be the best little friend anybody ever knew. On September 28th, at just 12 weeks of age, my new mom and dad met me in the backyard of the small house I was born in. I showed off a bit for them to make sure they liked me. I’m very polite, so I also introduced them to all my brothers and sisters, who were still waiting to be chosen by their new parents. My dad picked me up and held me really close. I love being cuddled and was so happy and excited I pee’d right on him. He didn’t mind at all. Dad just laughed, set me gently on the ground and we walked toward the front yard. I’d never been allowed out before. Even though I was a little scared of what my future would hold, I burst out of the gate and bounded across the freshly cut grass, that came all the way up to my belly. I saw a big F250 Crew Cab Pickup and hoped that’s where we were headed. Sure enough, my new dad walked straight over, opened the door, toweled me off and set me in the back seat. Wow, I’d even never had my own seat before. My siblings have always hogged everything. The back seat seemed huge back then, but not so much now that i’m a full grown dog. On the way home, we stopped to take another pee break and I had a little snack and some water. My new house is in a city called Los Angeles, it’s also in California. Can you believe I live in a city, but we’re right next to the Los Angeles river, so I get to play in the water and we go to the beach all the time. My parents had a business when I started living with them, but when my dad got sick and they sold it. Dad’s getting sick wasn’t so great, but it did give me a chance to become his registered service dog, which I just love. 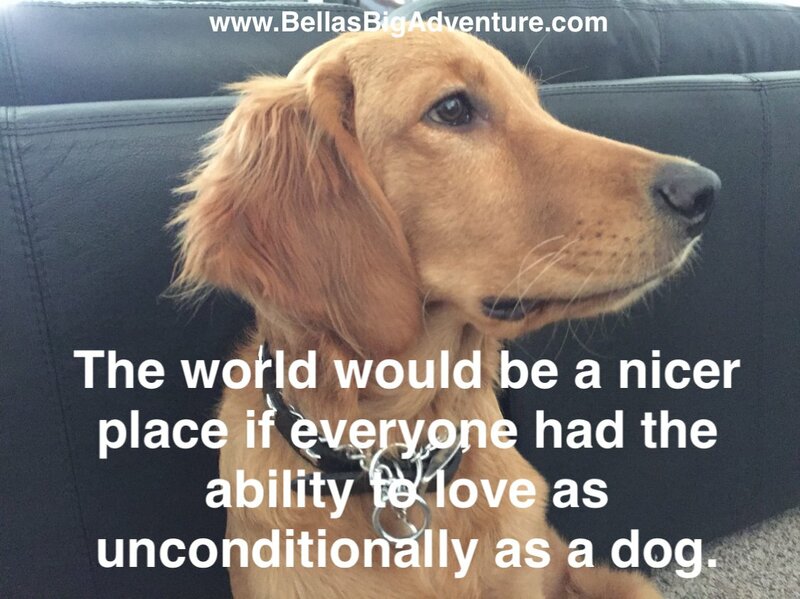 Being a service dog is an awesome responsibility. All of us who do this job are specially trained to help out our best friends in case of a medical emergency. It’s really important for everone to know that when I’m working, you shouldn’t come up and pet me. It could distract me from doing my job and my job is really important. If my dad says it’s ok, thats different. Just make sure you ask him first. My parents are really interesting people, they love culture and the great outdoors. They are really super curious and you can’t image all the places we go. It all started by driving around in my dad’s truck exploring California. Then last year dad got it in his head he wanted to drive to Connecticut to visit his mom. We started out and when we got to Moab, UT, mom and I realized we weren’t gonna be home for quite a while. By the time we got to Colorado, dad was ordering camera equipment online and let us know we’d be shooting movies of our journey. To be more specific, he said we’d be shooting movies of me, starring in my own travelogue. Since then, I’ve driven 17,500 miles around America. I’ve been to museums, art galleries, national parks, historical landmarks, amusement parks, iconic American institutions, great restaurants, as well as just about anywhere I can go swimming. I love swimming… At the beach… In a stream or a lake… I especially love waterfalls, I’ll even swim in your pool if you’ll let me. Well, that’s the short version. For the whole story, watch my videos. 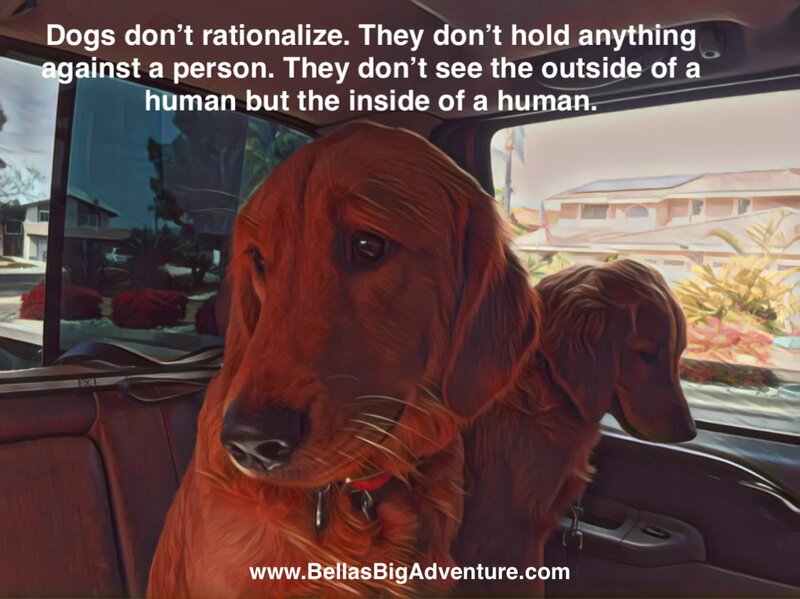 Bella's Big Adventure is the story of one little Golden Retriever whose journey takes her all over America, making friends and visiting places she has always wanted to see. This is so interesting to read about you! Love to see your adventures! Thank You for giving Bella a wonderful adventurous life. We have two goldens who came from similar beginnings. 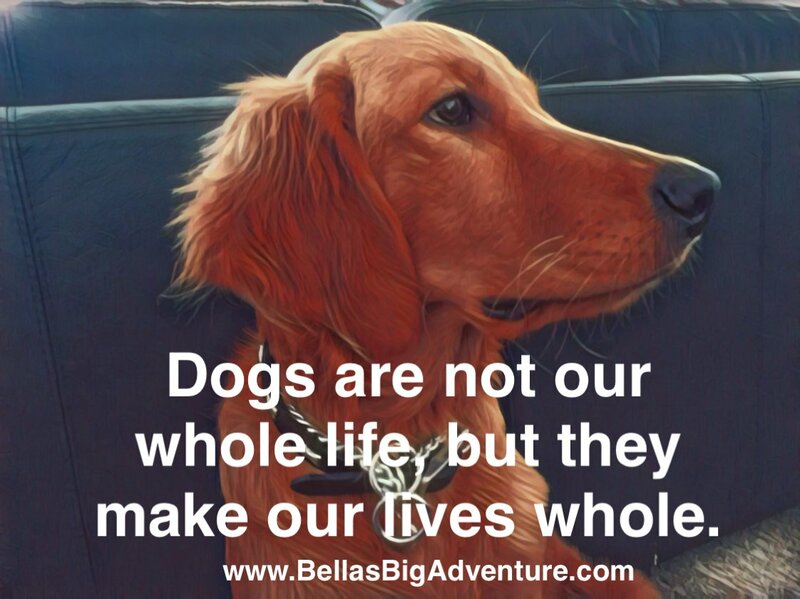 Our fur babies have traveled extensively throughout the U.S. and have loved every second of it. As for places to visit, our dogs love Durango, Colorado (which is very dog friendly). They enjoy spending summers in higher altitude places and winters in Florida. Thanks for follow me! Hopefully my adventures make you happy! Just doing our part to help make the world a better place! We do what we an to spread the love!